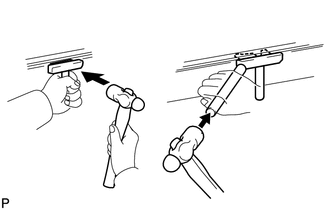 (a) Remove the 3 joints. 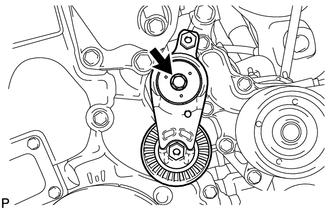 (a) Remove the oil filler cap from the cylinder head. 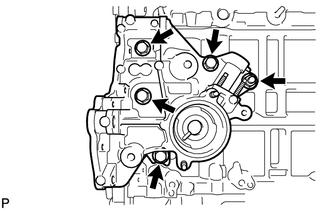 (b) Remove the gasket from the oil filler cap. (a) Remove the 8 bolts and 2 nuts. (b) Remove the ventilation case by prying between the ventilation case and cylinder block with a screwdriver. Be careful not to damage the contact surfaces of the cylinder block and ventilation case. 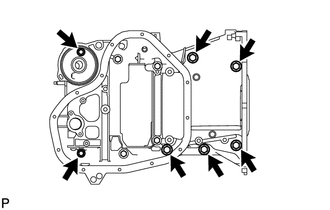 (a) Remove the 2 bolts, separator case and gasket. 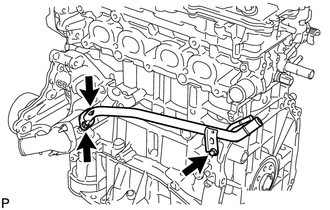 (a) Remove the bolt, 2 nuts, water by-pass pipe and gasket. 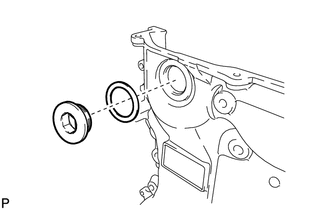 (a) Remove the bolt and V-ribbed belt tensioner. 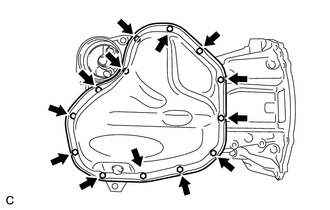 (a) Remove the 4 bolts, nut, inlet water housing and gasket. 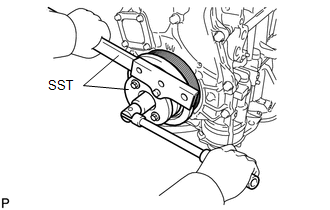 (a) Using SST, hold the crankshaft pulley and loosen the pulley bolt. 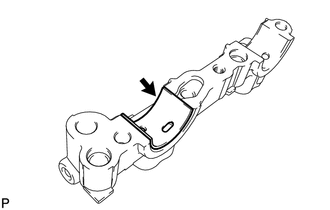 Further loosen the bolt until 2 or 3 threads are screwed into the crankshaft. 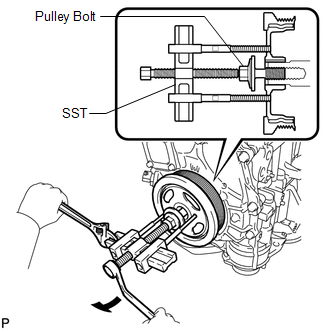 (b) Using SST and the pulley bolt, remove the crankshaft pulley. 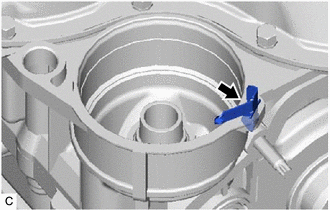 Apply a lubricant to the threads and end of SST. 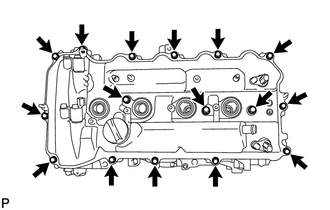 (a) Remove the 16 bolts, 3 seal washers, cylinder head cover and gasket. 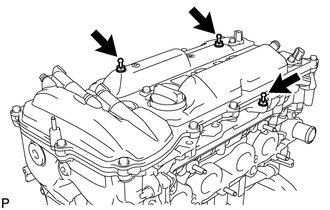 (b) Remove the 3 gaskets from the camshaft bearing caps. (a) Using a screwdriver, pry out the 4 plug tube gaskets. 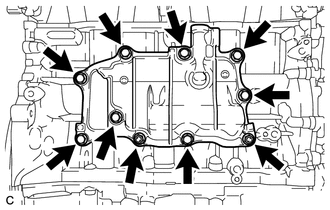 Be careful not to damage the cylinder head cover. 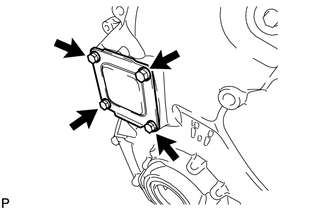 (a) Using a 14 mm hexagon wrench, remove the plug and gasket. 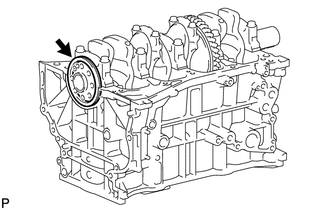 (a) Remove the 4 bolts, timing chain cover plate and gasket. 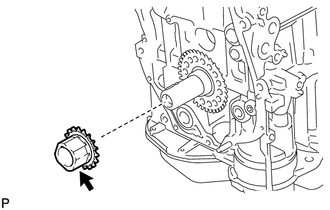 (a) Remove the crankshaft timing sprocket from the crankshaft. 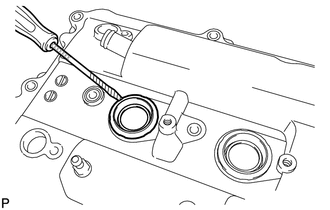 (a) Remove the oil control valve filter from the No. 1 camshaft bearing cap. (a) Remove the No. 1 camshaft bearing. (a) Remove the No. 2 camshaft bearing. If a stud bolt is deformed or its threads are damaged, replace it. It is not necessary to remove the ring pin unless it is being replaced. It is not necessary to remove the straight pin unless it is being replaced. 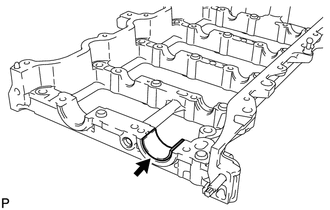 (a) Remove the cylinder block water jacket spacer from the cylinder block. Be sure to remove the water jacket spacer. 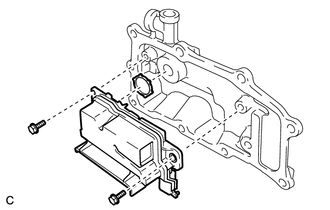 If it is not removed, it may fall and become damaged when the cylinder block is inverted. 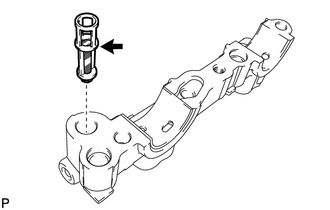 (a) Remove the oil filter bracket clip from the stiffening crankcase assembly. 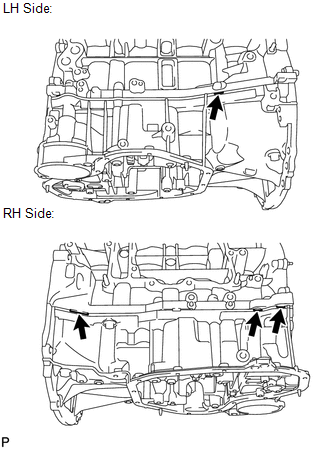 (a) Remove the 11 bolts and 2 nuts. (b) Insert the blade of an oil pan seal cutter between the oil pan and stiffening crankcase, cut off the applied sealer and remove the oil pan. 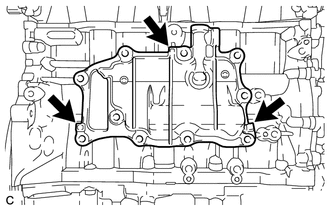 Be careful not to damage the stiffening crankcase contact surface of the oil pan. Be careful not to damage the stiffening crankcase flange. 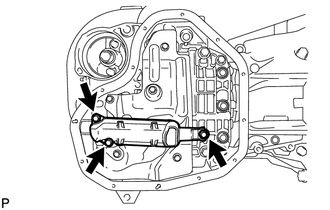 (a) Remove the 3 bolts, oil strainer and gasket. (a) Remove the 5 bolts and oil pan baffle plate. 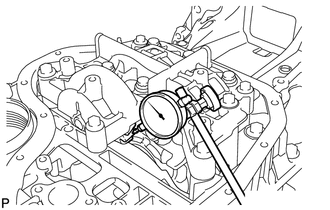 (a) Using a dial indicator, measure the backlash of the crankshaft and balance shaft as shown in the illustration. If the backlash is more than the maximum, replace the engine balancer assembly. (a) Remove the 7 bolts and engine balancer. 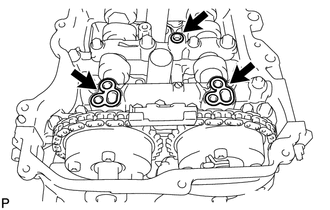 Do not disassemble the engine balancer. (a) Remove the 7 bolts. 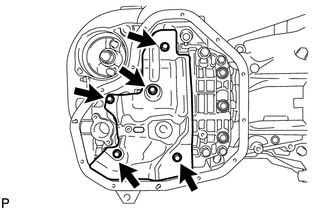 (b) Using a screwdriver, remove the stiffening crankcase by prying between the stiffening crankcase and cylinder block at the places shown in the illustration. 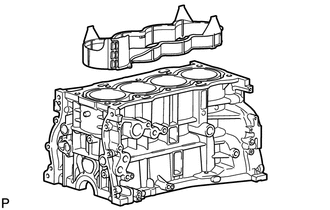 Be careful not to damage the contact surfaces of the cylinder block and stiffening crankcase. 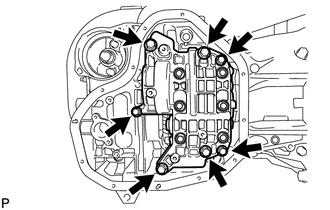 (a) Remove the rear engine oil seal from the cylinder block.